Sweep up faster and more thoroughly—at home and anywhere else with this regular-sized and mini-sized set. The regular-sized one-handed broom is armed with dense bristles that stay flush to the floor, brushing pet hair, dirt, and even glass into the foot-controlled, tight-to-the-floor dustpan. The bristles are electrostatic, so they actually attract dirt off of surfaces like carpets, tiles, wood, and furniture. The mini broom has the same design, letting you tidy up quick in the car or office. Full-size broom features telescoping handle that extends from 29" to 51"
Dimensions: 50" x 12" x 2.5"
5 stars for the broom & mini broom! I didn't think anyone could make improvements on your basic old broom....BUT THEY DID. I love my Wisp set. I never want a regular old broomar old broom again. I even converted my roommate to Wisp! It's fast, grabs up stuff you didn't even know was on your floor, and gets under the edges of furniture so much more easily than my old broom. 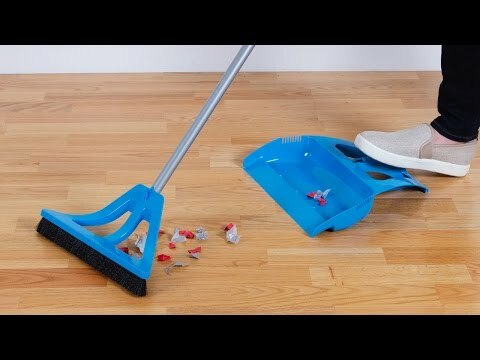 Love the single direction sweep and the easy pick up dust pan. Really does reduce that little line of dirt that the old dustpan would have left behind. The mini is great for helping me clean up my craft projects and inside my car. Beads, sequins, glitter? No problem! A million tiny screws? Bring it on. This household essential just got a sweeping makeover. WISP’s one-handed broom is armed with dense, short bristles that stay flush to the floor. And the bristles are electrostatic, too, so they’ll attract pet hair, dirt, and even glass into its foot-controlled, hands-free dustpan. It’s thorough, which means fewer passes with the broom. Eben Dobson is an avid golfer (nicknamed “Wisp” for his small stature and fluid swing) who designed his first prototype to pick debris off of a golf course. It worked so well that he decided to retool it for indoors, corralling dirt off of difficult surfaces (e.g. carpets, tiles, wood, furniture). 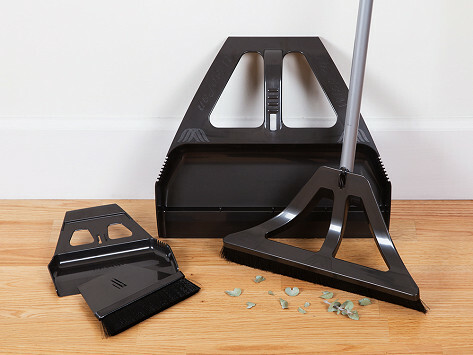 The dustpan creates a tight seal against the ground, so you’ll sweep into, not under it. And Eben even thought to tackle smaller jobs, with the mini WISP. It’s small enough to fit in a glove compartment or office drawer for on-the-go cleaning. Whatever you’re keeping clean, WISP will help you do a faster, easier, more complete job.